The sanctuary (the “holy place” or “holy of holies”), at the opposite end of the nave from the narthex (see below), represents heaven and the heavenly liturgy. In contains a square table, the holy table or altar, at which the sacrifice of the Eucharist is offered. The holy table has many layers of symbolism, and represents both Christ and his empty tomb. The Gospel book, a cross, and a tabernacle containing the Body and Blood of Christ (kept for distribution to the sick or dying) are placed on the holy table, along with candles for illumination. The sanctuary is usually a semicircular space (called an apse) containing chairs or benches for the clergy along the wall behind the holy table, with a central throne for the bishop. Like the nave, the sanctuary may be richly adorned with icons. Also within the sanctuary is the table of preparation or prothesis, at which the bread and wine for the Eucharist are prepared for liturgical use. 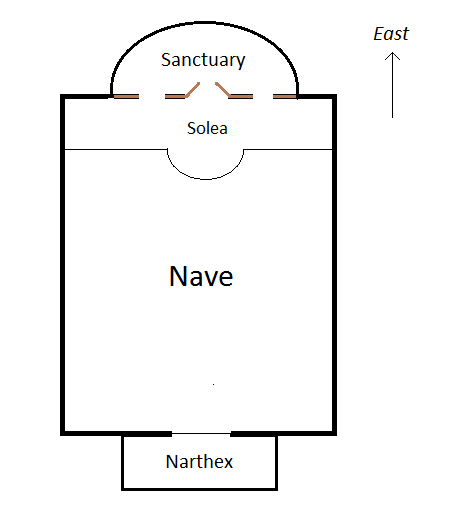 The most ancient plan of Christian architecture is probably the basilica, the large rectangular room used for public meetings, and many Byzantine churches today are organized around a large liturgical space, called the nave (from the Greek word for a ship, referring to the ark of Noah in which human beings were saved from the flood). The nave is the place where the community assembles for prayer, and symbolically represents the Church “in pilgrimage” – the Church in the world. It is normally adorned with icons of the Lord, the angels and the saints, allowing us to see and remember the “cloud of witnesses” who are present with us at the liturgy. In many church buildings, the nave opens upward into a dome, with the icon of the Pantokrater (Christ as “ruler of the universe”) above the congregation. The nave is also provided with lights – candles, chandeliers, or other illumination – so that at specific times the church interior can be brightly lit, especially at moments of great joy in the services. The nave need not be rectangular; some churches are round, representing the endlessness of eternity. The principal church building of the Byzantine Rite, the Church of Holy Wisdom (Hagia Sophia) in Constantinople, employed a round plan for the nave, and this was imitated in many Byzantine church buildings, while others use a cruciform (“cross-shaped”) layout to represent the cross of Christ by which we are saved. In traditional church architecture, there are no pews or permanent seating, to allow worshipers to move freely within the church buildings; portable chairs may be used, with benches for the elderly or infirm. Even where there is permanent seating in the nave, there are normally side aisles left clear so that processions may take place around the nave. If the nave represents the gathered assembly of Christian believers, the narthex (“entry room” or vestibule) represents that part of the world which awaits redemption. In ancient times, those were were not yet baptized, or those who had committed grave or public sins, would go no father than the narthex, and ask the prayers of those who made their way into the temple. The initial portions of the baptismal and wedding services take place in the narthex, and during feast-day Vespers, a procession may take place to the narthex to pray for the needs of the world. Doors usually mark the boundary between the narthex and nave, and choosing to cross this boundary brings us deeper into the presence of God.